Well well well, I’m back in San Diego again, this time for work. I was quite excited not only because this is my first business trip, but also ’cause it’s an opportunity for out-of-town posts!! Prior to the trip I googled and urbanspoon’d for where to eat. 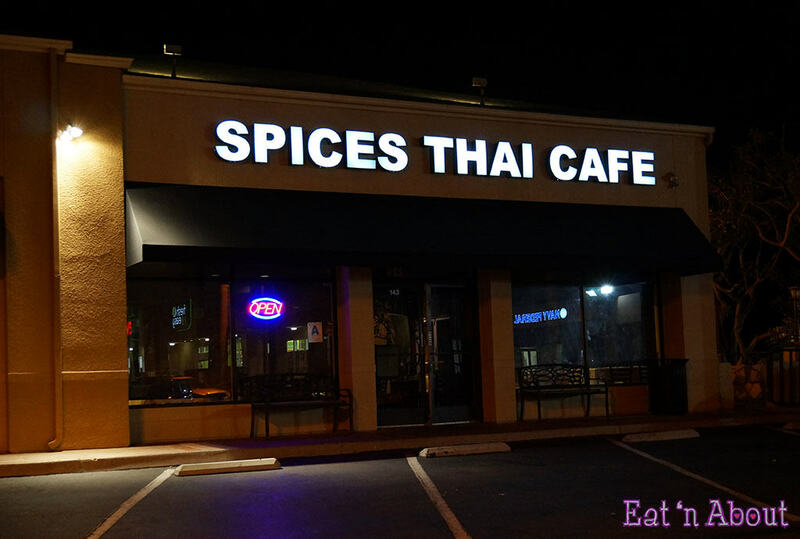 I finally decided on Spices Thai Cafe in Mira Mesa as one of the choices. I arrived around late dinner time and as soon as I checked into my hotel, I went out for food. Unfortunately, by the time I walked there it was getting close to closing, so I was only able to order take-out. I quickly picked out some items to go. Which was too bad though…the interior looked pretty fancy, more than the name of “cafe” would have me believe. 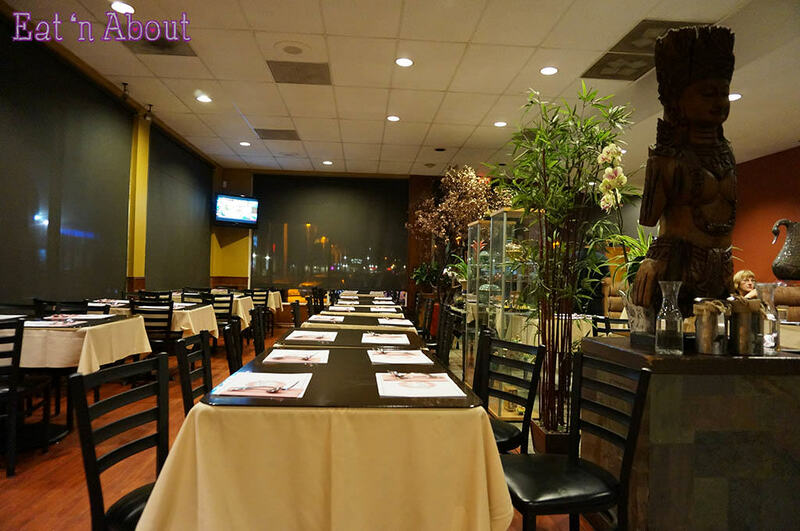 Clean and bright, the décor was very welcoming with some nice exotic statues as decorations. 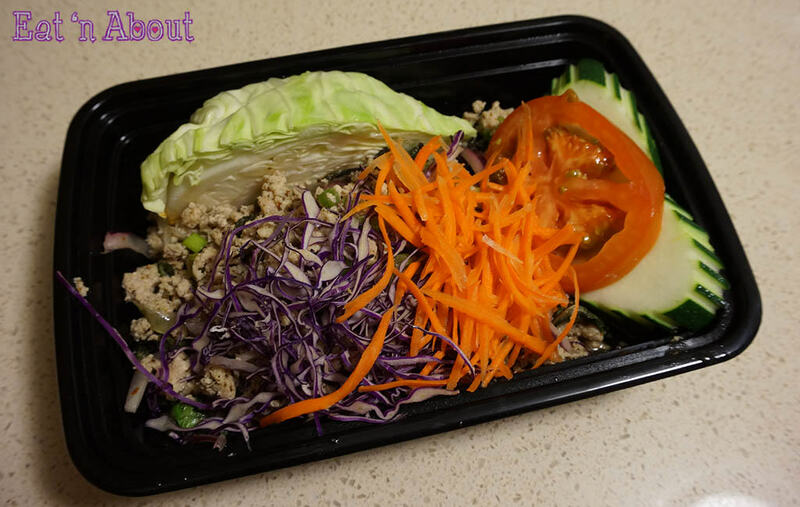 For appetizer, I picked the Larb Kai ($8.95USD). It is a ‘salad’ of sorts made of minced chicken that’s seasoned and spiced with lime juice, chili, rice powder, and fresh mint. This was really good. All the other ‘larb’ dishes I’ve had before were really on the salty side. The Spices Thai Cafe version was not and yet had the tartness of lime juice in a very pleasant way, like a light vinaigrette. This was also served with cabbage instead of lettuce. Only gripe was the cabbage wedge section was cut way too narrow, so there’s not much wrap action going on. Otherwise all of the sliced veggies (carrots and red cabbage) went very well together. Also loved the large mint leaves. For the main I got the Spices Soft Shell Crab ($15.95USD). It’s described as crab meat, egg, celery, and onion in yellow curry, so I assumed it was the crab with some hard-boiled egg in a runny yellow curry. As you can see it’s not. I was disappointed at first because I’m in the middle of coping with a nasty hacking cough so I really didn’t want to have any deep-fried foods. Spicy was pushing it already. I however did end up liking this in the end as you shall see. 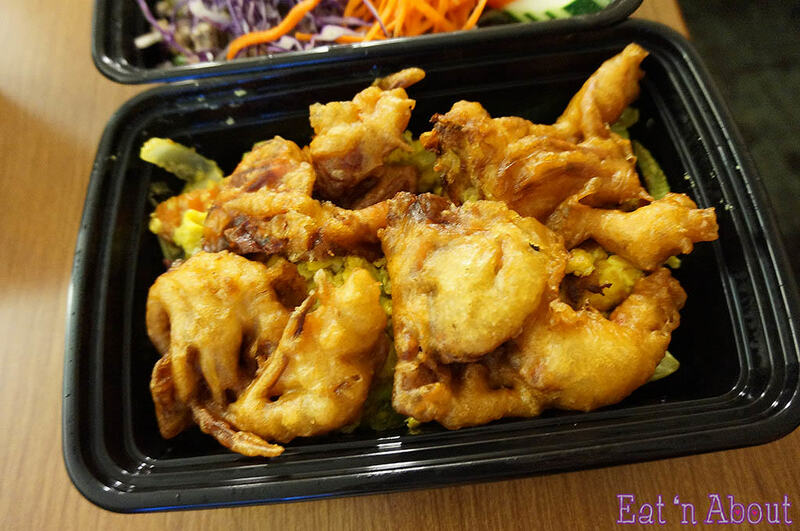 So basically this dish was deep-fried battered soft shell crab over a bed of yellow curry flavored scrambled eggs with celery, peppers, and green onions. The first few bites of egg were delicious, with the curry flavor very prominent. It did prove to be quite sweet though in the end. Nonetheless it was very yummy and went very well with the included rice (I chose brown rice for no extra charge). In the end I enjoyed my first night’s dinner in San Diego very much. Spices Thai Cafe really impressed me as I had originally thought it was a restaurant more catered to western tastes. However looking at their menu, they actually offer some exotic choices such as frogs legs and duck. If I had more time here and didn’t have other choices in mind, I wouldn’t hesitate on coming back.